Club Penguin Cheats by Mimo777 Club Penguin Cheats by Mimo777: Herbert Leaves and Club Penguin Message From Dot! Club Penguin has sent us a new message from Dot! Really? He gave up? 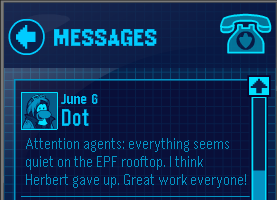 I went to the rooftop to check it out for myself, and yep, no Herbert! But, he wouldn't come out! Hmmm, I wonder what he is going to be up to now? Aww I wanted to get the yellow and blue dragon! I guess everyone should have been on the rooftop then.